About a month or so ago, JT sent me an email with four places for a little mini-family getaway. We’d been to a few on the list but ultimately, I didn’t care where we went so long as it was just the four of us. 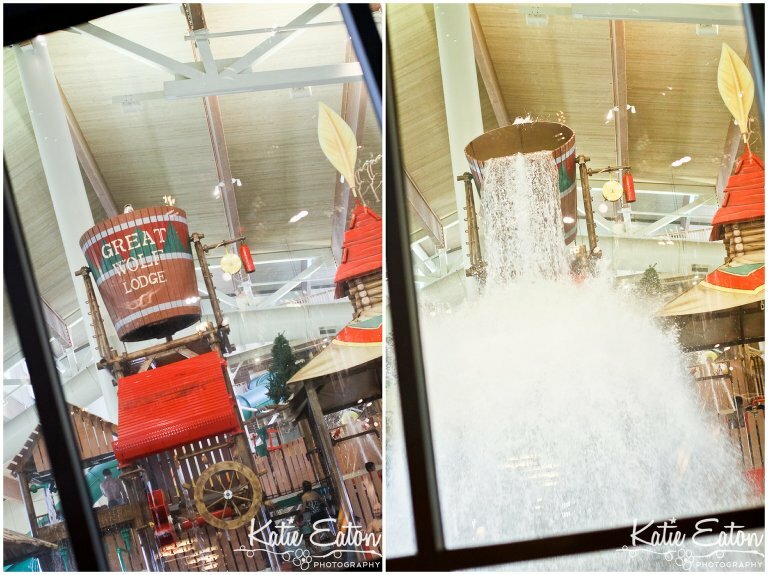 So, we opted for a new adventure and it took us to Great Wolf Lodge in Grapevine. Ever heard of it? Well, I hadn’t either … it’s mainly an indoor water park with tons of slides and zero-depth areas for little ones and the entire lodge is kid-centered. There’s an arcade, a little spa for girls to get pedicures, story time, an ice cream store, an animal stuffing station, MagiQuest, a craft room … I could keep going, believe me. Our room was a little camping suite (which was completely adorable). The kids had a tent-themed sleeping area with bunk beds and their own little television. Sabrina really thought she was in Heaven. Of course, we weren’t really in the room much because when you check in, you see the water park. Thankfully, we arrived in our bathing suits (I’m not sure Sabrina would have been patient enough for us to change). and then we were off … before you go into the park, they measure each kiddo to see which slides they are eligible to ride alone as well as which ones they need parents on with them (some you need to be at least 48 inches tall to ride). And when we were done and walked in … the big bucket fell. It took Tyler roughly six hours before he even ventured into the water and then he had a great time … but he was outside and nowhere near the big bucket!! and his Daddy even attempted to show him that the bucket wasn’t going to fall on him … but Tyler wasn’t convinced. he opted for donuts with mom instead. And Tyler never went down a single slide. He kept looking all around when he was standing … with a look of fear that at any moment he was going to get sprayed with water. But, thankfully, he didn’t let it ruin his trip … he was happy to walk around and lounge with me in the outdoor cabana and watch his sister go down the outdoor slides. And Sabrina LOVED every second of the water park … the slides that scared me she giggled on and wanted to go again and again and again. And after our first day I was asleep by 7:45P! Here are some other things we did at the lodge.